Canadian tourism continues to grow at a faster rate than the global average. This pace is also true for Northern Ontario where we are home to a dynamic and diverse tourism industry that significantly contributes to our local economies. To meet the challenge of the changing marketplace Tourism Excellence North is offering core programming to raise the bar on visitor value, encourage stronger visitation and impact your bottom line. Tourism Northern Ontario is pleased to announce this year’s core training program supporting both operators and communities. Learn at your own pace 24/7 with Self-Assessment Tools designed to assist both those who sell tourism experiences and communities that look to tourism as an economic driver. From the 10 Essentials for both Successful Travel Products & Experiences and Touring Routes, Visitor Appeal Assessment Tool, or an in-depth Community Tourism Assessment Index, these tools are designed to show not only what you are doing right now, but where you need to make improvements to increase your appeal to the visitor. Our Case Studies series shows how others are adapting to change to create more successful and compelling tourism experiences that engage consumers. Programs again are directed at either those who provide tourism experiences and the communities that host them, as well as programming that brings together operators and destinations. Group learning in and out of a classroom setting enables you to learn and share with your peers from a variety of perspectives. One-and-a-half day in-depth workshops designed to inspire Northern Ontario community leaders to advance tourism opportunities at the destination level. Cochrane, May 8-9th – inviting those who support the tourism industry as we look to grow snowmobiling tourism in the region. Blind River, May 15-16th – inviting those who support the tourism industry as we look to grow the touring segment in response to new touring route development and promotion. 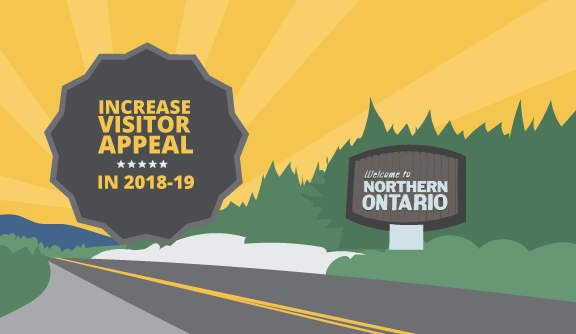 Two-day in-depth workshops designed to inspire Northern Ontario tourism operators to develop new or enhance existing visitor experiences that are more compelling for tourists, support referrals and return visits as well as overall increased visitation and yield. Let’s get out of the office and on a short field trip within our region or a competing destination to observe, discuss and engage with those who have already defined success. Building a Quality Tourism Destination: Snowmobile Touring, September 24-27th, 2018. Our Fast Track to Success program will see independent training specialists visit 30 providers of tourism experiences on-site to provide insights to increasing visitor appeal and market readiness. Seeing their experiences through fresh eyes has energized operators into making service enhancements that ultimately increase visitation and yield. Join us this fall at Northern Ontario’s largest tourism industry event. Two full days of learning, engaging and networking with a variety of sessions and workshops for all segments of our tourism industry. Sault Ste. Marie, November 12-14th, 2018. This core training will be augmented by specific training around international export-readiness, business succession, green tourism, visitor centres, and for our angling industry guide certification and product development for changing demographics/markets.